Revitalift - Does Revitalift Work? Question: I see there are so many anti-aging products in the stores and I’m totally confused which one to buy. I’m a pretty tough consumer and I like to know exactly what I’m getting for my money, so I’d rather go with a known brand such as L’Oreal’s Revitalift than taking a chance on an unknown make. Am I making a good choice for helping my aging skin? Answer: As a consumer it is wise to be concerned about spending your money on a reputable brand, particularly when it is a product sold over the internet, as many anti-aging creams are. Fortunately, L’Oreal is a long-established company with a good reputation in the skin care industry. Also, because their products are sold in retail stores, the consumer has the opportunity to test the products before buying. 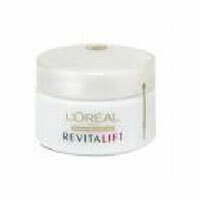 In regards to L’Oreal’ Revitalift skin care range, a good amount of research can be done via the company website. Designed specifically for the 40+ age range, Revitalift addresses the main problems associated with aging skin including dehydration and lack of elasticity which leads to lines, wrinkles and sagging skin. Using scientifically developed ingredients such as Pro-Tensium, Elastin, Vitafibrine and Pro-Retinol A, the Revitalift range helps tighten and tone the neck and contours of the skin, leading to a more youthful, refreshed appearance. If you do shop for an anti-wrinkle product in a health store, pharmacy or on the Internet, you’ll often find hundreds of different brands containing a confusing array of ingredients. You may be tempted to experiment with different products until you find one that works. But this approach may be expensive. More importantly, not all products contain the quality and quantity of necessary ingredients to positively promote long-term improvements on the appearance of wrinkles and an overall healthy complexion. That’s why you’ll need to do a little bit of research to find the best, most potent brand for your needs.